This concert saw the last performance of founder Quentin Crida for the next 6 months or so, as he will be on sabbatical. CTB will continue in the capable hands of Erik Dippenaar Artistic Director, and Michael Maas Administrative Co ordinator. The audiences will miss Quentin’s humour and anecdotal snippets of contextual history as much as we will miss his viola and violin playing. I always enjoy CTB performances very much and I expect their high standard of playing and fresh interpretation to continue in Crida’s absence. Entries and tutti sections are outstandingly synchronous and clean, and coupled with their ideology of recreating the performance of works as if for the first time, the resulting sound is unassuming and uncomplicated even in the delivery of complex material. When presented in this way, the music takes on a kind of innocent realism that reflects the consciousness of the time, in which these sounds were considered to be new, exciting, and avant guard. The use of period instruments accentuates the relative simplicity of the harmony and tonality compared to the scope of modulation and melodic possibility of romanticism and after, and gives each performance a feeling of authenticity, not only in the sound but also in the manner in which this orchestra plays, having the awareness of a chamber group. 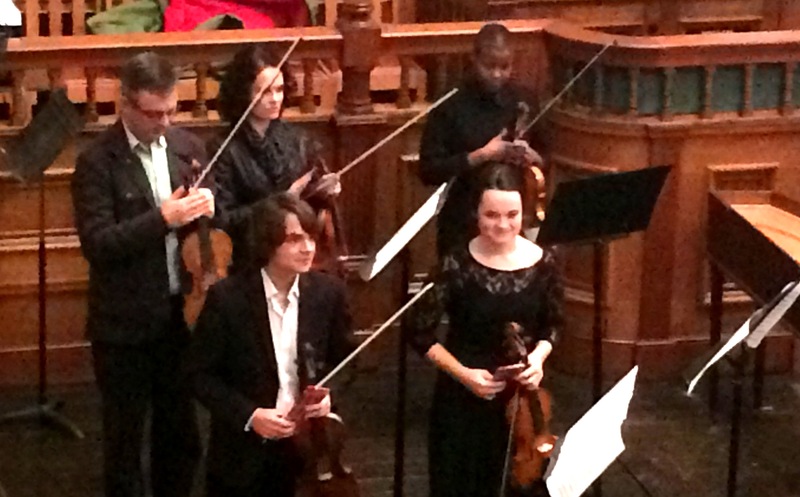 Bright Young Baroque is a great opportunity for upcoming talent to experience playing with an orchestra and an audience, and is one of the central ethical principles of CTB. Jana-Mari van Dyk‘s Scarlatti (Se Florindo e fedele) came across with good projection, a wonderfully rich tone, and excellent control of vibrato – which is perhaps more difficult for a singer once accustomed to it. The simplicity of her delivery matched that of the orchestra in accentuating the astounding mathematics behind Baroque music, which can become lost in over-interpretation. 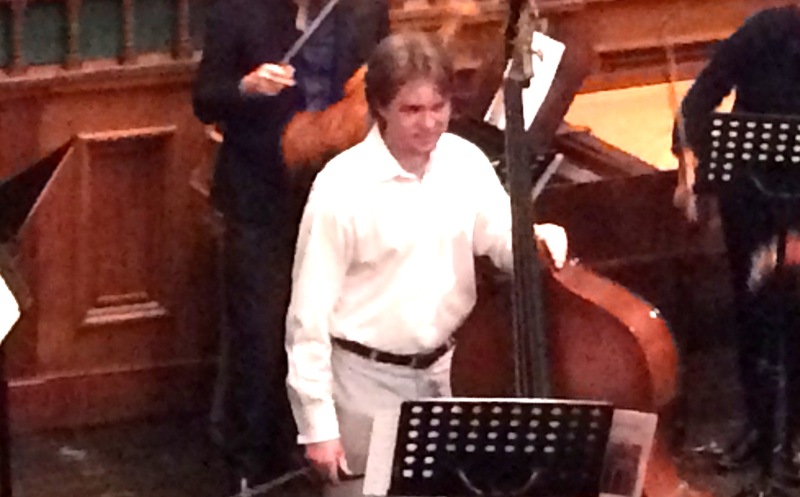 Johannes Visser (Dragonetti’s Andante and Rondo for Double Bass) is a promising performer indeed, demonstrating excellent reach and dexterity in the left hand. This instrument does not appear easy to play, and a post concert chat with Johannes confirmed that it can be every bit as monstrous as it looks! Besides navigating the distance one has to cover in the left hand, the right hand has a completely separate technique which must also be mastered. This is of course true of any stringed instrument, but the Double Bass is exceptional in it’s enormous size. Visser handled the many challenges of his instrument professionally, producing the lovely warm tones that make the study worth the effort. 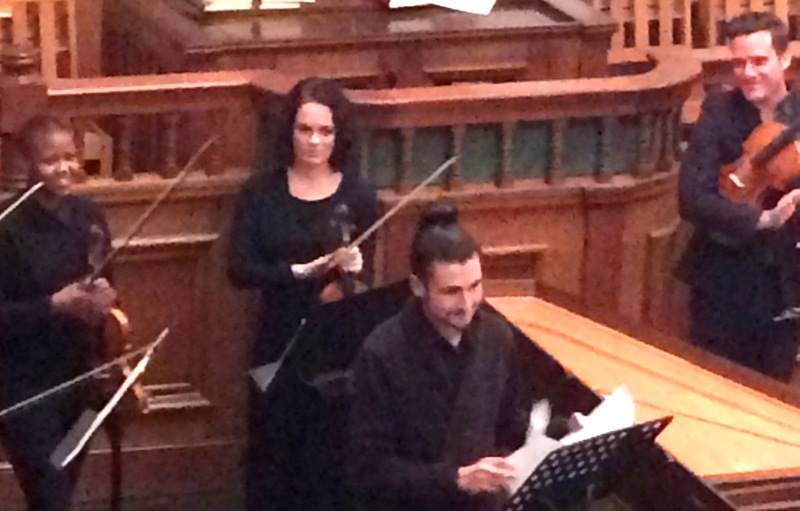 It was good to see Jeffrey Armstrong emerging from CTB’s tutti, taking the first violin of Bach’s famous Concerto for Two Violins in D mol. A dynamic and entertaining violin player, his experience with CTB has no doubt been invaluable as an opportunity to pick up on guest performer’s techniques, and this certainly comes across in his performing. Second violin Stephanie Lawrenson is a lyrical and sensitive violinist with a good ear for balance. Despite having a brighter sounding instrument she compensated well, using her volume when required. Together they delivered a very listenable conversation at a comfortable tempo. Another emergence from the CTB tutti was Fifi (Refiloe) Olifant, leading the Lalande Les Fontaines de Versailles. This first peace after the interval glowed with a hazy pastoral dance feel, easily conjuring dreamy images of grape vines, white pillars, and terracotta tiles. Olifant’s first violin was accurate and well balanced. 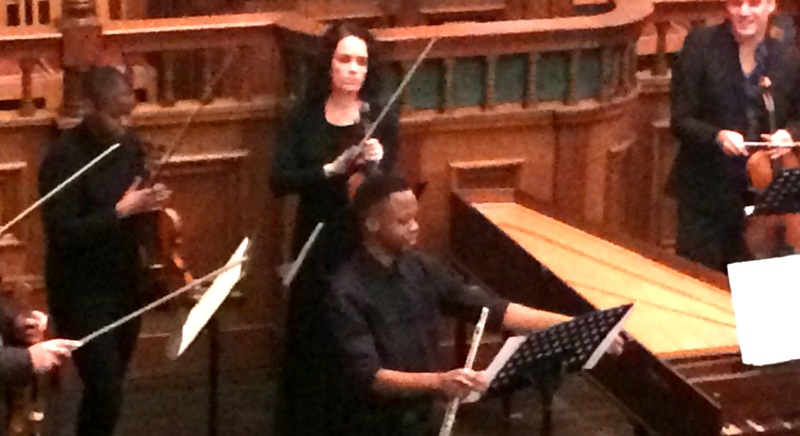 Nkosana Gugu Soko‘s Concerto for Flute in G dur, Quantz, was a delight. In the right hands, his instrument has the advantage of being one of the most beautiful sounds in the orchestra, but unlike the double bass, the flute appears easy to play, masking the hidden technique of breathing. Soko demonstrated both a mastery of this skill, and impressive finger technique over tricky intervals and arpeggios. I must confess surprise in recorder player Joshua Frank (Concerto for Recorder in G dur, Vivaldi) owing to a quite remarkable display of technique for his instrument. He is clearly very talented, but also seems very comfortable as a leader, bringing the orchestra into the 3rd movement with a simple nod that landed on his first note, the first of a crazy run for both recorder and orchestra, and this entry was immaculate! Widely known for his reputation as a virtuoso, Vivaldi certainly didnt let this one slide – the concerto is packed full of his signature style, well performed by Frank with note perfection even during scorching semiquaver triplets that leap between octaves. Completely in character, Crida announced the final work quoting PDQ Bach: “And now we come to the moment you’ve all been waiting for: the last item on the program.” The first movement of Albinoni’s Sonata IIa 5 in C dur (Largo) charmingly follows for a while the famous Pachelbel canon, and then thankfully modulates and meanders peacefully through the neighbouring keys. CTB was again led by Olifant with exquisite tone and alluring dynamics. Then a fugue begins (Allegro) with Olifant taking the first voice, joined by viola, then violin, then viola, then harpsichord and Celo to make five voices. For those who are familiar with baroque and choral arrangement this is all very pedestrian, but in my experience, and perhaps keyboard players can identify with this, there is something very amazing about being able to identify each voice of a fugue as it enters, played by a different instrument, as each voice has it’s own identifiable sound whereas in keyboard versions all the voices sound the same. The third movement is again Largo, all sweet and sad, followed by another five voice fugue – an extremely complicated form when the voices are combined, and yet relatively simple when each voice can be identified separately. As a form, the fugue is both fascinating and intellectually challenging for the audience, and I found myself wondering at the modern misconception that people were pretty dumb back then because they hadn’t invented the internet. CTB concerts always remind me that following and being entertained by baroque music requires far more intelligence than our modern completely non-engaging entertainments on TV, computer, or cinema. Were we smarter before the industrial revolution? What are your favourite works? Please lt us know on the Classical Top 100 survey! 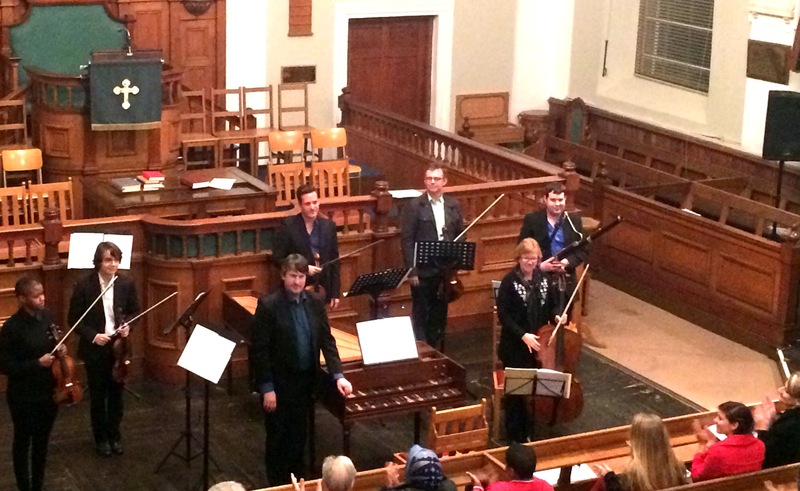 This entry was posted in Classical Music Review, Concert Review and tagged #AndyWilding, #BrightYoungBaroque, #CamerataTintaBarocca, #ClassicalReview, #ConcertReview, #PeriodInstruments, Fifi Olifant, Jana-Mari van Dyk, Jeffrey Armstrong, Johannes Visser, Joshua Frank, Nkosana Gugu Soko, Quentin Crida, Refiloe Olifant, Stephanie Lawrenson. Bookmark the permalink.